In early 2013, I launched my first novel as a paperback. In this article I’d like to talk a little about the process leading up to the launch event, what worked and what didn’t, in the hope that fellow authors might learn something of value. My experience has taught me that, with a little preparation, any indie author can stage a successful launch event. I also believe that every book has a unique selling point that can be used to help bring in readers. Before you even start thinking about the launch itself, it’s vitally important to make sure the date you have set is realistic. Will everything be completed on time? Self-publishing the print on demand way can take longer than you think; if errors are discovered in the proof copy and a new version has to be issued in the printers, your process can be set back weeks. Just to be safe, give yourself several weeks longer than you think you need. At this point I’ll assume the author has done his or her job properly and is producing a thoroughly professional book. It’s important for a Kindle edition to be professional, but doubly so for a paperback. There really should be no visible difference between your book and something a traditional publishing house would put their name to. The front and back covers need to be eye-catching and vibrant, and just as much attention needs to be paid to interior design, which is an art form in itself. Consider a venue for your launch. Your own book will probably dictate the best place to use, but practicalities also come into it (staging a launch far from your home will eat into your budget). 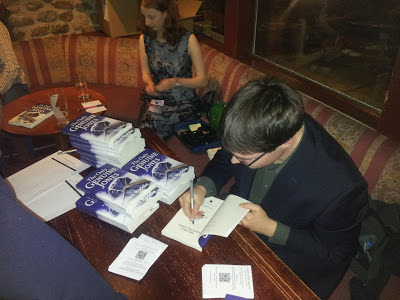 To use The Only Genuine Jones as an example, my book has a strong connection with Glencoe and the Highlands (and I also have personal connections with the location), so it was the obvious choice for my launch. Most importantly, the vast majority of my readers also have an interest in Glencoe. If I had launched the book in my home town the event would probably have been a flop. Does your venue require payment, or a donation of some kind? Make sure this is settled well in advance. I opted to donate 10% of proceeds from my launch to the Glencoe Mountain Rescue Team. Think about your readers. If you have written an historical thriller set in Warwick Castle, get on the phone and talk to English Heritage. If your book is set in a Cornish village, look up the nearest bookshop or cafe. Your own words (and your readers) hold the answers. I think this point proves just how important it is for an indie author to be aware of their target audience. What is my unique selling point? My book has a connection to the history of British mountaineering, a history that strongly involves Glencoe. I am also known for experiments with Victorian mountaineering equipment–something I have integrated into my book and a subject popular with my readers and fans. These factors, combined with interest in the popular climbing blog Glencoe Mountaineer which I established, helped to make my book launch newsworthy. Most authors, if they have done their homework, will find they have something similar in their book’s background they can use. What format will your launch take? 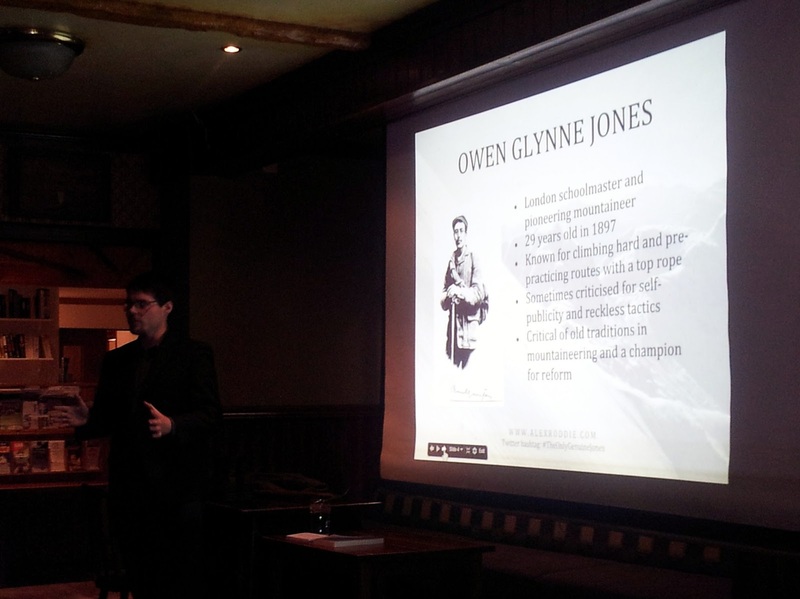 I opted for a short presentation (20 mins) followed by a reading (5 mins) and then book signing / general hobnobbing. This worked well for me, but every book is different. It’s worth thinking about alternative ideas but very important to bear in mind that your audience will have a limited amount of attention they are willing to devote to you. If you are staging your launch in a cafe or bookshop during the day, a single brief presentation might not be appropriate; similarly you might not have a large volume of people all there at the same time, but rather a trickle of readers throughout the day. Start telling friends and family about the launch, and make full use of your social media platform. Generate some buzz! Hashtags can work well if you use Twitter. At this point you ought to start thinking about real publicity. Connections here are useful, but I was surprised how easy it was to obtain exposure in newspaper articles, blogs, and even a radio interview. A well-written press release targeted to the right publications, and an active Twitter profile, are the only tools you need. You will need a stock of books before your launch; how many you need will vary depending on a variety of factors, but I think it’s better to order more than you think you will sell. Firstly it gives a better impression to be signing books surrounded by piles of them, and secondly you shouldn’t have too much trouble selling excess stock. I ordered 60 for my launch which was just right. 32 were sold at the event itself (which was attended by about 50 people), and the rest were reserved for pre-orders or sent out as review copies. Printing books through print on demand takes time. Order your batch several weeks before the event. It would be a disaster to turn up only to have no books to sell! To help generate momentum, start taking pre-orders for signed copies for readers who will be unable to attend the launch. Make sure you will be able to fulfil these orders. By this point you should have a stock of books waiting to be sold, a confirmed venue, a solid plan, and at least a rough idea of how many people are likely to turn up. Hopefully you will have secured some exposure in local press and radio, or at the very least have a robust social media campaign. If you’re going to do any talking, start rehearsing! I used a set of revision cards to prompt me during my talk, but in practice I didn’t use them and ad-libbed it. Push any worries about nerves to the back of your mind. People will be there to listen to what you have to say and this is your moment to shine! Think about what you plan to wear. It’s a professional occasion but not necessarily a formal one; I think in most cases venue will dictate dress code. I opted for a suit jacket, dark shirt and no tie. Do you have a support team? I was lucky enough to be accompanied by my partner Hannah, who dealt with cash transactions and kept track of how many books I sold. I was also helped by a number of friends who turned up to support me. I think it’s important, particularly if it’s your first launch, that you have someone you can rely on for support and a few friendly faces in the audience. A friend with a camera is also a useful person to have at hand. Prepare some publicity material. I gave out business cards, vouchers prompting readers to review my book on Goodreads, and also Smashwords coupons entitling readers to a free digital download of the book (which I forgot to give out to some readers!) I also made sure my short story Crowley’s Rival would be on free promotion during the launch. If you have an email newsletter, prepare some signup sheets; if you have other books out, print off some leaflets. If possible, set up early and be there to welcome readers as they arrive. Test any technical equipment you are using and make sure you know how to operate it. If you are speaking, have a glass of water ready, but don’t drink any alcohol beforehand (my launch was in a pub so this was a temptation to be avoided!) Set out your books where you are going to be doing the signing and make sure you have a pen. These may sound like obvious tips but there is a huge amount to remember so something small is bound to be forgotten. Write down everything you need to do; don’t rely on a mental checklist. Most importantly, relax! This is your night, probably a high point in your career as an author, and you deserve to enjoy it. Try to talk to everyone, engage in conversation with your fans. Answer as many questions as possible. Consider planting a friend in the audience with a pre-planned question to get your Q&A session going. If it’s busier than expected and you sell out of books, that’s fantastic. If it’s quieter than you had hoped, don’t be disheartened–look at it as an opportunity to find other ways of selling the books in your personal stock. Any opportunity to increase exposure is worth it. Throughout the event make sure everyone present is aware of your social media channels. These events are brilliant ways of increasing your online readership. It’s also worth contacting newspapers and radio stations a second time to let them know about the launch, particularly if sales have been strong since. Even if they didn’t bite the first time, they might think a successful local book launch is worth writing a piece about. The main thing I learned about my book launch is that it’s surprising what you can achieve if you put just a little effort in, even without the backing of a publisher. The launch gave me a brilliant opportunity to showcase my work to some of my most dedicated fans (plus some new readers), and made me feel pretty good about the book. Even viewed as simply a morale-booster it was worth it, but combined with the fantastic exposure, the extra sales, and the opportunity to talk to the people who actually buy my work, I really can’t think of any negative aspects to the entire process! I would wholeheartedly recommend a book launch to every indie author out there, even if you think it isn’t for you.